At the same time (related or not, no one will ever know) I have been suffering from a severe writer’s block which has made all kinds of writing, academic and otherwise, unbelievable difficult. I suspect it has to do with my sudden, visceral realisation that anything that is written (and crystallized on this blog or on paper) is but a fleeting imprint of the workings of my brain at that particular point in time. The process of going back and back again, re-writing, editing, erasing, writing again - to accurately capture the thinking process and output at that time, it almost drove me crazy. It drives me crazy and it leaves me paralyzed with fear. This is what I think writer’s block is. The fear of the loss of control that process entails, confronting one’s thoughts after they run out through your fingers. 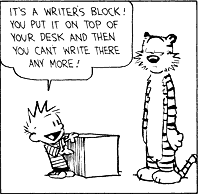 The writer's block is actually a heavy, presumably wooden object. It reminded me of this excerpt that I read at the beginning of my time at Harvard, in fall 2016. For some reason it came to my mind 2-3 weeks ago. And I remembered it today in class when Andre suggested I try and articulate the writer’s block. “Can I ask you, Kate, writer to writer: do you ever write something and go, “Smashed it, that’s brilliant, I’m keeping that, that’s amazing.” Does it get to the point where you can step back and go, “That’s a really good piece of writing” or, “That’s not such a good piece of writing.” Or do you just write it all down and not think of it critically? So for tonight, consider this finished - a raw blog post. The funny thing is, objectively this took no more than 15 minutes to compose and write down. (No going back and editing, re-editing.) The thinking and preparation for this however, if you think about it, started many years ago. It stands at the end of a very long process. 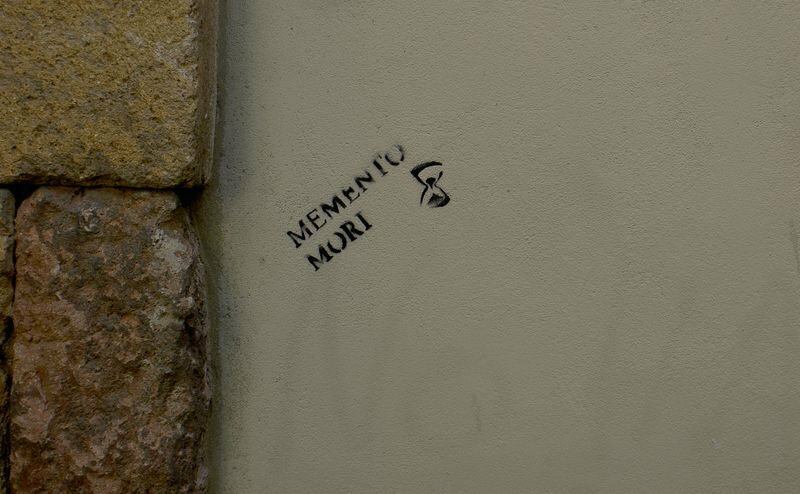 It started when I learned to think in words and to articulate thoughts, a couple of years later to do so in English. Then learning to write, how to use a computer etc. And to have an idea and to trust that it is worth expressing, even if run through this imperfect and flawed processor that runs on glucose and 20 W, called a brain. Finished. Looking back at my quest for more awareness over the last few weeks, the principal route so far was via my senses. At times it was possible for a certain period of time for me to maintain a heightened sensitivity for especially visual detail (or rather detail in context) - in short: the colors seemed brighter and deeper, textures more three-dimensional. Soon, as the mind could not resist interpreting and going about its business of abstracting: some new experiments with perception and abstraction - pattern recognition. Carrying attention across different scales, the patterns on the carpet suddenly curiously resemble those of satellite imagery of agricultural landscapes. Micro = macro. A leaf on the walkway, encountered in the dim shadow of the street light, and how it on first glance looked like a bird’s feather. And indeed, how similar both are in structure and function. Suddenly, the bare New England trees in late February transform into thin, plucked birds, having lost all their feathers in the storms of November. Soon spring will bring back their plumage and they will unfold their green wings. Last week, on a particularly warm spring morning: how sounds travels in the absence of clouds! I can hear conversations far across Harvard Yard in astonishing detail, the waves of sounds and the warm rays of light collude and weave and amplify right into my ears in astonishing high-definition. Not only into my ears though, truth be told: they amplify me. Next stage: synesthesia principally between eye and ear. Delightful syncopal symphony of two kids on swings on a nearby playground, downbeat, off-beat. Overlay it with a Bob Marley groove - “could you be, could you be, could you be loved…”. Enter a flock of Canada geese flying across the sky, every goose at its own speed, yet in formation, keeping a precious, carefully, ever so subtly adjusted distance from each other. The movement of their wings creates atmospheric reverberations. Now I can no longer be sure: do I see it, or do I feel it on my skin, or something else entirely? Do I know it first, then feel it? Finally today, a stormy, rainy day, I am amazed by the interplay of humidity in the air and on the ground, and the distant whirring of the wind. The raindrops, falling sideways from the overhanging roof, in fast, metallic threads. Like shooting stars traveling upside down towards the earth. And just as I had started to write this all out last night, my inbox pinged and another kind of notification arrived: from school. We were informed in an email about very sad news that one of our classmates had just passed away. He was set to graduate with us in May. Since we received this message, ripple effects of grief, disbelief and shock have been going through our system and community. And with it, an opening of hearts, an outpouring of compassion and love for the friends and family. However, this is not the appropriate place for public condolences - there will be better times and occasions. Holly Haney: I hope not to ask after too fresh wounds. Are you finding this practice helpful/constructive? Joichi Ito: I find this a fascinating topic and something I think about quite often and meditate on as well.